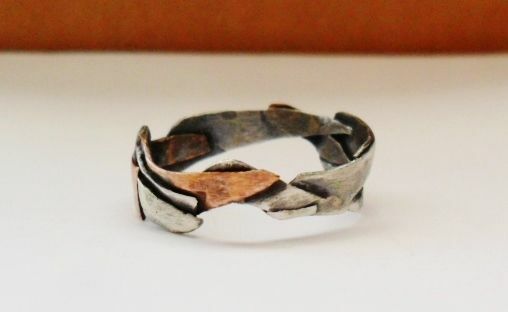 Upcycled Sterling! 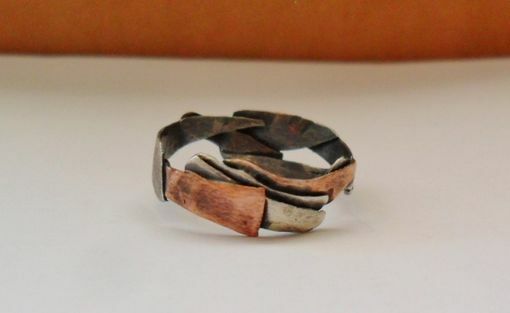 All pieces of sterling silver is used, pieces that were cut from other works of art and assembled with copper pieces in a unique way to form this cool, textured mens or womens ring. 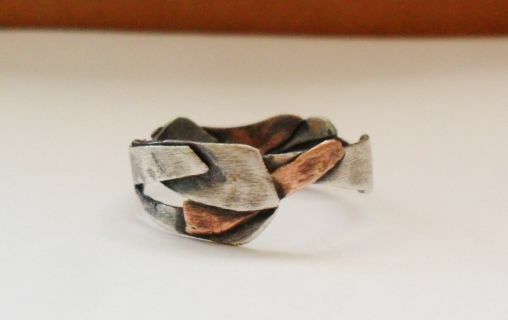 Your ring will look different than this one, but be just as unique, and just as textured with layers of sterling silver and copper making it your one of a kind piece. Its light weight and very comfortable to wear. You choose your ring size and the ring is approximately at most 1/4 of an inch wide or less. I love the ring I got from her. She is a very wonderful person. This woman doesn't only have amazing skills with metal but also is wonderful as a person because she made it possible for me to buy a ring from her and get it shipped over night so that I would be able to have the ring as a Christmas present for a family member. If you buy from her you should know that you have a new wonderful piece of artwork that is unique in its own way.